Here is another Wip. I worked on really getting the lighting together for my comp. Trying to guide the eye a little better. Im pretty happy with the way it turned out. I might try focusing on some specific sections like the mushroom. But I feel like It is a subtle enchanted wonderland. I was looking at providing the model but the size is pretty dang large. Maybe we can work on getting it out on the download page. Ill post some making of stuff soon as well. wow, nice challenge. I will give it a try and i think i will start from here. Thank you for the scene and i’m very excited to create a vegetatif environment. Here is a first preview of my work in progress. I want to make my picture better but i’m slow because with my job it’s very difficult to associate the two things. I don’t begin the background on my picture. I will add light beam on the rock because it’s the main subject of my composition. Don’t hesitate to give your opinion. I post what I did until now. Focused on mushrooms just following the crowd and the SSS suggestion. All Blender with BI render. Added DOF and kind of Ektachrome 100 curves with postpro in Blender itself. Basically I adapted the scene to Blender and tweaked it a bit more. 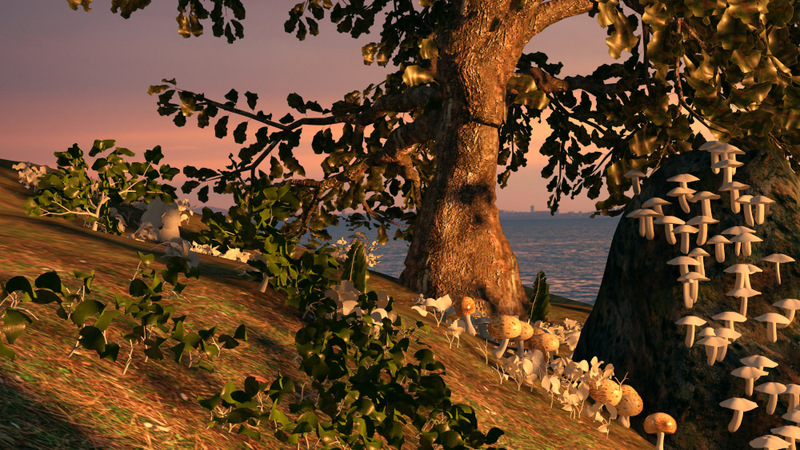 [li]did a basic lighting setup, with a sun lamp (the only one raytraced), a sky spot lamp projecting buffered shadows, a generic area lamp without shadows to subtle “light” the “tree dome” and a textured spot to light the mushroms area, with shadows. [/li][li]added some Voronoi based cloud noise displacement to the rock/cut trunk. [/li][li]created materials for each “thing” with a quick and reasonable detail/work balance. [/li][/ul]Not sure what I’m going to do with this, but suggestions and comments are welcome. You can download the Blender scene from here, I’ll delete it in some days/weeks. You may have to wait in order to download properly the file, because it’s still uploading. Here is my version, but it’s still in progress! xcomb Looks awesome! I feel like you should play with the shadowing a little more. Maybe throw some more light onto the front mushrooms since they feel like the subject of the piece. Also the reflections on the mushrooms in the back looks a little purple. I think just a darker blue would make it feel better. But once again awesome work! prestonplatt: Hi guy! It’s awesome. You really reach your target pulling the eyes to the right point of your picture. The colors, shaders and temperature of the scene is great! This a hard scene to light, even to DP at movies so congratulations! If I could say something its about the camera position, just to obtain more bokeh effects, nature scenes prove the best opportunities to this kind of effect. The SSS of big mushroom stalk, I’ll increase a bit until realize the effect. If I had to choose one quality that I like very much is your option for this natural color grading, you preserve in the same time the feeling of a nature scene but give us some warmth, some happy sense. Your rock! Andi2008: I like very much of your scene composition. The choice for this camera angle is a great opportunity to a lot of experiments and decisions. Keep us update! glorund: There a lot of things to work. It’s hard to talk about light and shaders in so early post. I could mistake talking about and I prefer more updates to start. But I can talk of the camera and composition. It’s in a good way. If you want to focus in SSS it’s a great camera angle. I don’t understand about Blender postpro, but Ektachrome 100 have a very low sensibility, a high contrast, great for “open” scenes like beaches, savannas and desert, I don’t know if it is a good choice for a interior jungle. If somebody used to use this kind of film could help us to understand the best kind of scene and light to use Ektachrome 100. I’ll wait for more updates of your scene! xcomb: I like a lot of your camera. It’s a tough decision opting for a close. But your shaders looking amazing! The foliage shader is the best! If you allow some notes. I’ll create an option more of shader for the brown mushrooms in a different shade, but not so much different, just a bit. As you have a lot of them I think is important create a little difference between them to more realism. I don’t know if I like or not of the red ones… I’ll wait for your new update to see better. Congratulations it is a great start! I don’t know if just me, but to see your images I need to right-click and say ok to Google Site question about enclosed download. Thanks for the feedback i do agree with everything you have noticed, i am going to work on shading and displacement to give more difference look! Thanks to take your time for tell me your feedback. I improve the light of me scene because it’s very dark for the moment. The direction of the sun has changed and the exposition of my camera is up. I boosted the rock light because it’s the main subject and i try to find a good balance for my composition. I will try update my picture this week ! Alomst done, i need to work on sss on mashrooms and maybe add more dirt ontop of the hat and probably i will lower the specular on hats too! I will also add some insects and butterflys. 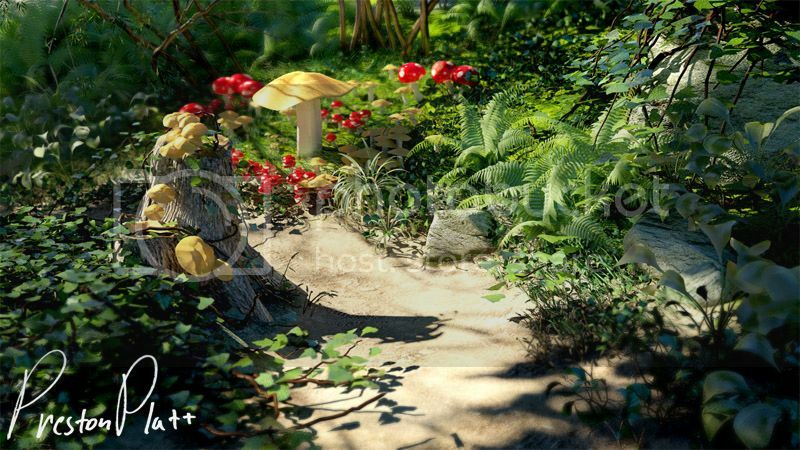 Xcomb Love the foliage shader and textures and your lighting is complementing it. I don’t know if you are trying something realistic or semi realistic.I would say semi realistic would be great considering those Red Mushrooms. Try some other color/shader for those tree mushrooms to complement Red ones at present both are not jelling together ,yes you are right about SSS and high specular. Try adding bit more variance and vibrance in your red Mushrooms too along with those in the behind. If you want you can try adding tad more yellow/sun contribution so that SSS would work bit more. You can also try changing your focus from tree mushrooms towards red ones. well these are my personal opinions ,your work is great as always. Thanks man i will consider your sugestions! Hey, any positive/negative reactions welcome. I was hoping that someone would attempt the Green larva angle ,Thanks that you attempted this. I can understand generating the larva shader is bit hard but I think with SSS shader you can achieve it easily. At present it is giving bit plastic feeling. 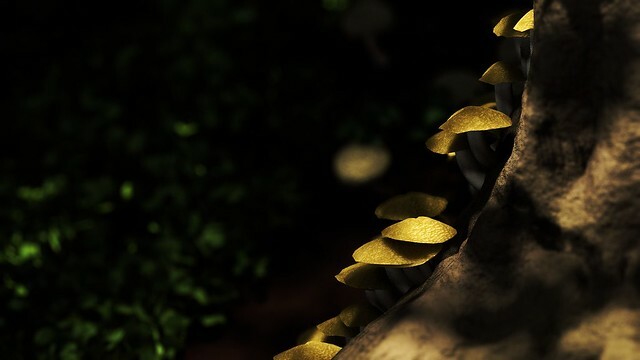 Same goes with Mushroom shader try improvising them. Background rock shader isn’t working it appears that it has some FG artifacts,there is lot of sky visible but it’s impact on the image is not visible. same goes with the bounce light. Also try defocussing the BG a bit. I would also recommend try different key directions which would compliment your camera angle in much better way also makes larve shader more appealing. Here is an update and i am still in consideration as far as the defocus and bloom effect, i will need to render in full HD format after all is done.